"It walks, it talks, it slithers on it's belly like a reptile!" Yep, that is how I used to be greeted in the morning by my dad. It has been so long since I have been able to blog. School became all consuming and the time I did have after was divided between LT and my Dad. But I am now in summer school and I am hoping I can make more time for this little project. I have always enjoyed blogging. Isn't it funny. When things pile up and you have to prioritize your day, your favorite things, the things that bring you joy, are the things you push off to the side and walk away from. Well, peeps, I am hoping to be back and focus on my joys in life and not be mired in the stresses. Speaking of stresses here is an update of some things going on in my life, just to catch you up. 1. School is over and I am grading summer school students. Bad news is they cut the pay in half. BOO! 2. Dad is doing better. Had a few medical issues/emergencies that we dealt with/dealing with but everything seems to be working out. 3. I have scaled back my travel to Oklahoma to about once a month to see Dad. I am trying to do better on calling him more. I always called Mama about everyday so it is weird to try to do it with Dad-just not every day, maybe once or twice a week. 4. THE WEDDING DATE HAS BEEN SET! I REPEAT: THE WEDDING DATE HAS BEEN SET! We are look at a fall wedding in October in Oklahoma. So excited! I know, about time right? I am not giving details, because that is fodder for a post! 5. My principal has resigned and going to another district. While at first it is a cause for celebration, I am hesitant because what are we going to get? Sometimes its better the devil you know instead of the devil you don't. Well, my lovies, I guess it is time to get back to the grind. I will leave you with this picture. 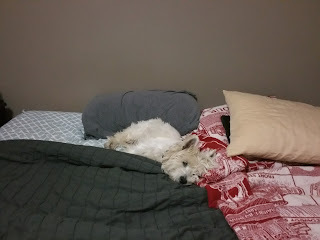 It is of Gavin waiting patiently for me to get up in the morning so he can take over my spot in bed! May your spot in life stay warm and cozy! I am so cute, how can I get in trouble?